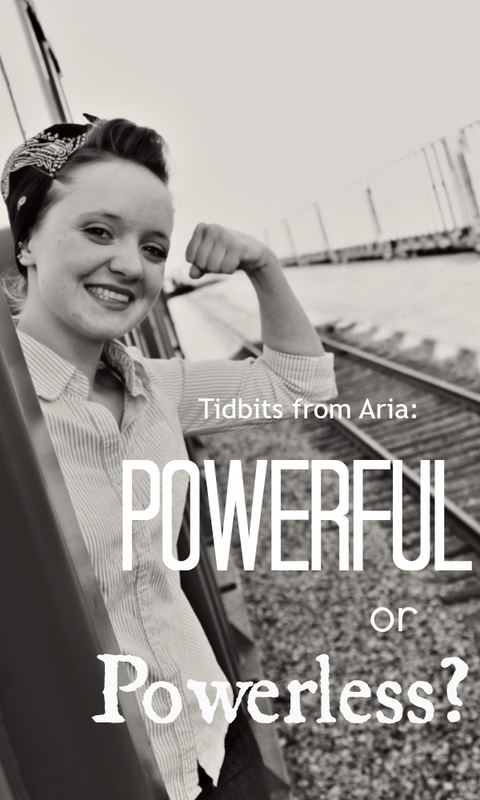 Tidbits from Aria: Powerful or Powerless? I love this tidbit from Aria on determining if you're a powerful or powerless person. Such good practical application, not to mention so many tweetable quotes in here! Especially with Valentine's Day fast approaching, it can be easy to pawn off the responsibility for our happiness (or lack of) onto someone else. Aria's insight today shows that isn't the only option, though, and we can choose to be powerful people instead! Are you POWERFUL or POWERLESS? Being powerful is a critical part of maintaining healthy relationships. Not sure where you fall? Which statements tend to describe your life more accurately? A) I have to go to work today. I want to find another job, but I’ve tried and I just can’t. Oh, it’s three o’ clock. It’s time to go to that book club again. I’m so worn out, but I don’t want to disappoint them. I’m so unhappy. If only he was more romantic, our relationship would be better. I hope today’s better than yesterday. My boss ruined it by criticizing me. or B) Oh, time for work. This job isn’t what I want to do for the rest of my life, but I’ll enjoy it today and keep working towards that other opportunity. You know, I went to that book club once and I didn’t enjoy it. This week, I’m going to try a yoga class instead. Something isn’t right in our relationship. I’m going to kindly discuss it with him after work so we can solve these problems. Today is going to be a good day. Whatever comes, I’ll make the most of it. The first three were the thoughts of a powerless person, and the last three were powerful. So are you POWERFUL or POWERLESS? Powerful people know that they can only control themselves, and do not seek to control others. They know that they are responsible for their own happiness and choices and do not place the burden on others to make them happy, powerful, or content. They are consistently themselves, allowing others the freedom to be themselves as well. Powerless people fall into three categories: the rescuer, who takes responsibility for someone else’s life, the bad guy, who manipulates and intimidates to get their needs met, and the victim, who looks for a rescuer to make them happy. As Silk said, “Powerless people use various tactics, such as getting upset, withdrawing, nagging, ridiculing, pouting, crying, or getting angry, to pressure, manipulate, and punish one another into keeping this pact… Any sense of love and safety they feel by gaining or surrendering control is tenuous and fleeting.” Each of the three categories of powerless people use these tactics to get their needs met but usually end up only in more fear and anxiety. The truth is, as humans, we have very real emotional and relational needs that must be met. We long to know and to be known. Each one of us has had different experiences in all kinds of relationships, and some of those relationships have caused deep pain through betrayal, mistrust, neglect, and abuse. That pain can lead us to act out of fearful powerlessness instead of acting out of powerful love. I do not know what you have gone through, and I do not know the pain you have experienced, but I do know that that pain does not need to define your relationships today. Replacing the lying thoughts that cause you to act out of fear--such as thinking you are worthless, a mistake, or unlovable--and replacing them with truth can start you on the way to becoming powerful. You are valuable, purposeful, and dearly loved. I am sure of this because as a Jesus-follower, I know He believes that about you and me, no matter what. Being powerful in relationships is something I’m continuing to learn myself, but as we learn to take responsibility for our own lives without having to continually bend to the opinions and control of others, we can become free to be ourselves and let others do the same. Safe, accepting, and healthy relationships cannot coexist with manipulation, fear, and control. They only exist when two or more powerful people take responsibility for maintaining their connection by taking responsibility for their own actions. It takes effort and honesty, but is so worth it. Today’s going to be a great day, friend. And that is a powerful thought! What do you think about being powerful/powerless in relationships? If you're willing to share, how do you see this affecting your views of Valentine's Day this year and beyond? In nearly every circumstance that life has thrown my way, even when the odds were massively against me and my back was up against a wall (literally in a few cases), I have always tried to look at things like the "B" answers. There is hope and the prospective of a positive outcome, or at least a valuable lesson to be learned, in nearly all that we experience. I don't let my battles rob me of my happiness and optimism - quite the opposite actually, they fuel those things on and keep my positive, grounded, and apt to wake up with a smile on my face no matter what. Awww, good. I mean, I'm sorry, but I'm glad it has arrived at the right time! GO BE POWERFUL, ABIGAIL! This is great advice to apply for all aspects of life! Also, cute pic! I think sometimes we like the pity party we hold for ourselves and forget we are powerful. I think I forgot that... nope make that, I know I forgot that. This was good, very good. Apparently, Blogger ate my comment yesterday. So here I go again! I really liked this post, it somehow changed my mindset about everything. Yesterday I didn't feel like going to work. But then I felt that I was grateful for my supermarket job, and the money I earn with it to pay for things which make me feel good (like fabric or vintage clothing). Today is another example. I'm in a long-distance relationship. Today is Valentines Day but he couldn't make it to be here today and I have to work so I can't visit him either. At first I was really sad and jealous of people who are able spend this day together. But now, I'm really looking forward to the week he'll spend here in two weeks, and he said we'll have our own special Valentines Day. And I feel happy for the people who can spend it together, they deserve it! Thank you for writing this great post.